In this session, the party learned first-hand that the dungeon might change if they stay away too long. The party, now rested and vowing to defeat the necromancer once and for all, came upon a welcome surprise approaching the northern cave entrance. Two Ogres were seated on tree stumps at a makeshift table in the cave mouth. Hanging by his neck in the entryway was the necromancer himself, quite dead and adorned with a sign “Wizurds Keep Owt”. The Ogres demanded a 50GP entry fee for the ‘market’, and told the party to “follow the signs” in broken common. Following the arrows crudely stenciled on cave walls, the party made its way through now well-lit tunnels to the jail room, where they spied a group of six Dwarves talking near a group of prisoners – a troll, three Orcs, two Dwarves and two Human females. It was clear the Dwarves had been mistreating their captives. Having the element of surprise, the party wasted no time engaging the evil Dwarves, but had a tougher fight than expected, as after a volley of missile fire, the six charging Dwarves grew to twice their size. 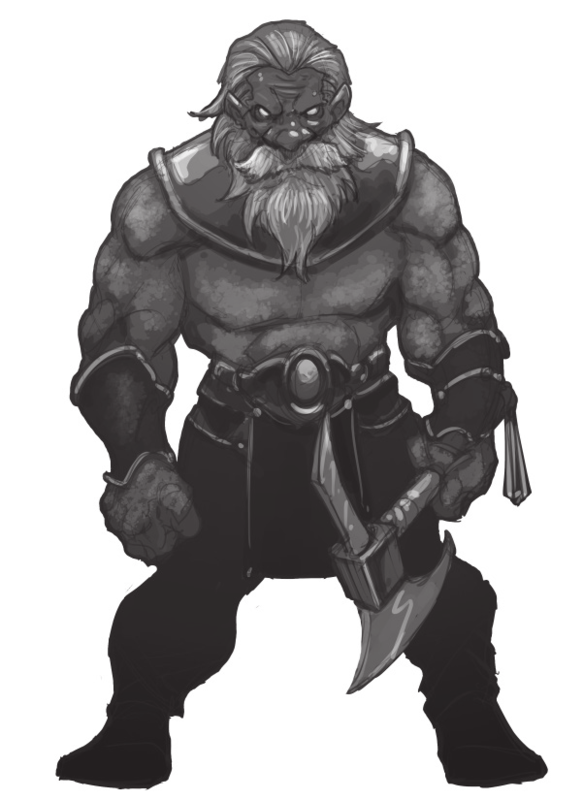 The party emerged victorious but badly weakened, and decided to take the Dwarf and Human prisoners, now freed, and escape through the eastern swamp entrance and make haste back to town (Duergar image from Swords & Wizardry Monstrosities). All went as planned, with Garros in the lead scouting the way, until he rounded the corner past the giant crab pool. The party had previously defeated the crab, but clearly dark sorcery was still at work in the caves, as the now undead crab attacked! Garros, still badly wounded, ran back to the party, crab in pursuit. Again the party was victorious, but not before losing Baldue to a lucky crab pincer strike. The party limped back to town, no treasure in hand yet grateful to be alive.